In Sydney Word by Word, design duo, Sonny & Biddy, reflect the sights and sounds of Sydney in vibrant colour. Each page features one, simple word, with a full page illustration providing greater nuance. For example, ‘Fashion’ features a figure resembling queen of colour, designer Jenny Kee, while ‘Splash’ accompanies a pool meets sea, presumably Bondi’s Icebergs. The book features the best of Sydney’s iconic sites, from the Opera House and Harbour Bridge to Taronga Zoo and Cockatoo Island, interspersed with everyday scenes. Annual events, like Sydney’s Sculptures by the Sea and the bright lights of Vivid are also pictured. You may recognise the Town Hall steps, the QVB, the smoke stacks in St Peters’ Sydney Park, and Newtown’s ‘I Have a Dream’ mural. The scenes are mostly city and beach-oriented, with a nod to Sydney’s multiculturalism through imagery of pho-slurping and Chinese dragon-dancing. Escalators, buskers, snacks and terrace houses provide snapshots of urban life. 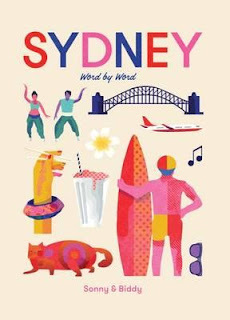 Overall, Sydney Word by Word captures the energy, colour, beach vibes and must-sees of Sydney, and can be used as a ‘first word’ type book for toddlers through to all-ages gift book. A Melbourne title illustrated by Michael McMahon is also available.